1. relatively small. 2. equally huge. 1 1. relatively small. 2. equally huge. 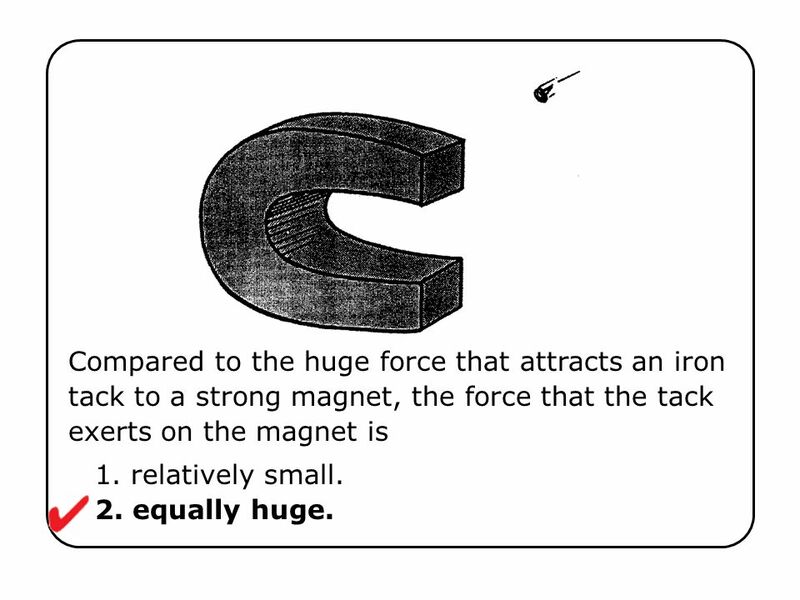 Compared to the huge force that attracts an iron tack to a strong magnet, the force that the tack exerts on the magnet is Ch 24-1 1. relatively small. 2. equally huge. 2 1. relatively small. 2. equally huge. Compared to the huge force that attracts an iron tack to a strong magnet, the force that the tack exerts on the magnet is Ch 24-1 Answer: 2 The pair of forces between the tack and magnet comprises a single interaction and both are equal in magnitude and opposite in direction—Newton’s third law. 1. relatively small. 2. equally huge. 3 1. rotate clockwise. 2. rotate counterclockwise. 3. remain at rest. 4 1. rotate clockwise. 2. rotate counterclockwise. 3. remain at rest. 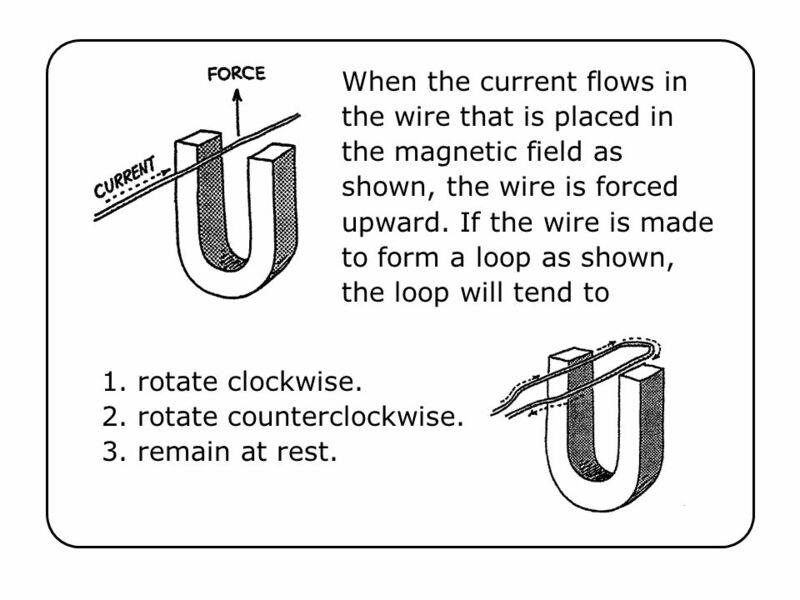 When the current flows in the wire that is placed in the magnetic field as shown, the wire is forced upward. If the wire is made to form a loop as shown, the loop will tend to 1. rotate clockwise. 2. rotate counterclockwise. 3. remain at rest. Ch 24-2 Answer: 1 The left side is forced up while the right side is forced down as shown. If you make the loop rotate against a spring and attach a pointer to it, you have a simple electric meter. At maximum, it can only make a half turn. But if you make the current change direction (alternate) at every half turn, it will rotate continuously as long as the alternating current persists. Then you have a motor. Download ppt "1. relatively small. 2. equally huge." Magnetism. Observe: SNSN Attract or repel? Observe: SNSN Attract or repel? Unit IIA Magnetism Reference: Ch Essential Question: How is magnetism different from electricity? Q29.1 A circular loop of wire is in a region of spatially uniform magnetic field. The magnetic field is directed into the plane of the figure. If the magnetic. Magnetic force on currents N S I F N S I F P.62 Fleming’s left-hand rule P.62. Lenz’s Law AP Physics C Montwood High School R. Casao. Lecture 17-The Magnetic Field Chapter 24 Friday, March 6. Physics 6B Magnetic Forces and Fields Prepared by Vince Zaccone For Campus Learning Assistance Services at UCSB. Physics 1161 Lecture 15 Electromagnetic Energy Work. CHAPTER 24 - MAGNETISM AP Physics 2 – Mrs. Lorfing. Quick Practice In what direction is the magnetic force on the wire?